Calabasas, CA, United States (4E) – Kourtney Kardashian has been making status updates on her social media accounts with cryptic post and her followers are quick to speculate that they are geared towards her ex-partner Scott Disick . 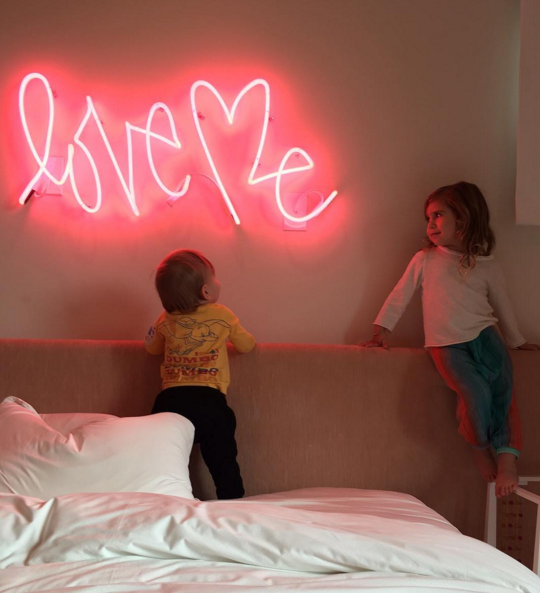 As per her latest Instagram post on March 5, Saturday, She posted a snap of her two younger children, Penelope and Reign, starting at a “love me” neon sign mounted on the wall. This was posted almost a day after her children’s father, Disick was photographed pictured drinking beer and partying with half naked females in Mexico on March 4. This comes months after Disick has entered a rehabilitation center for substance abuse. On Friday, Kardashian , 36, also took to Twitter to say this: "A smile hides my pain, a hug masks my heartache, and a laugh covers my tears.” She did not mention any name regarding her posts but fans are saying that these are all directed to Disick , who has been partying here and there again after months of being sober. In Disick’s latest interview with People, he said, "The truth is I just [want] to live my life and I want to have a little happiness and a little balance. The truth is rehab did help me and now I'm just trying to be responsible. I'm not out here trying to get wasted, but you know what, I will have a beer on the beach. I'm not doing drugs, I'm not doing anything insane, so I think people just need to relax." He pointed out that he cannot say at home every single night and people will expect him to be sane. He added, "In the end, I'm trying to live my life. I'm trying to live it healthy. I'm trying to be there for the people I love, which is Kourtney and kids, but you know what, we're not together." The people involved in these reports are yet to comment.